If you live nearby, you can train with me in my home gym or at-home training is available. Do you live too far away? No problem! 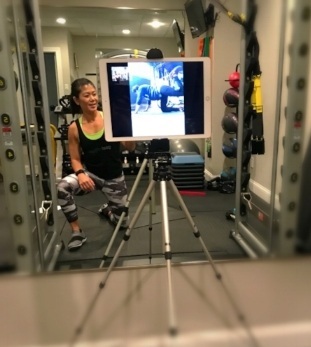 You can train in the comfort of your own home with minimal equipment via live streaming. My goal and passion is to serve you so you can achieve your goals but we will have fun in the process. I truly believe that training should be fun. I program workouts for each individual because no two bodies are the same. You will get one-on-one detailed attention from me. We will progress at your level and most importantly, you will feel great! Your workouts won't be the same week after week, either. If you follow me on Instagram, you see that my workouts are varied, challenging but doable... your workouts will be like that, too. And you will see and feel the results of your hard work. Let me help you get started! Contact me for more details.